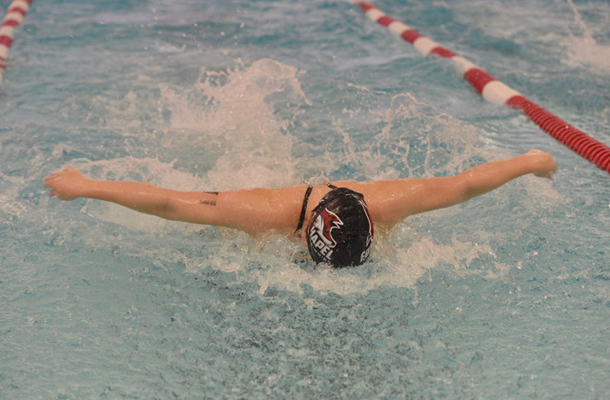 The Fox Chapel girls 200-yard freestyle relay kicked off Day 1 of the WPIAL Class AAA swimming championships with a fourth-place finish in a school-record time of time of 1 minute, 46.12 seconds. The previous record was 1:48.48. It was a fast start for the Alle-Kiski Valley representatives as more medal-winning performances followed. The Foxes quartet Grace Gackenbach, Zoe Skirboll, Leia Ross and Vivian Shao moved up two spots from their sixth seed and knocked more than four seconds off their seed time. The relay was a boost to Skirboll, who lowered her school record in the 200 individual medley (2:00.25) with a second-place finish. Only the WPIAL champion in each individual and relay event automatically qualified for the PIAA championships set for March 13 and 14 at Bucknell. All other times will be compared to the times from the other districts to form the field in each event at states. Plum senior Justin Decheck posted a pair of school records in taking sixth in both the 200 freestyle (1:44.15) and 100 butterfly (50.84). The 200 free record stood since 1992, and the previous 100 fly record was established in 1990. The Plum girls 200 free relay also earned a medal and established a new school record as Delanee White, Devan Taylor, Elizabeth Glasspool and Alexis Smith clocked in at 1:48.71 to finish eighth overall. Mt. Lebanon bested the field to take home the WPIAL title in a time of 1:43.87. Taylor switched up her Day 1 focus from the 200 IM to the 50 free, and she took fifth overall in a time of 24.05 seconds. Melanie Buddemyer, a Penn Hills graduate, retains her WPIAL record in the 100 butterfly set as a senior in 1984. Mt. Lebanon senior Trinity Ward won the title Thursday with a time of 54.44. North Allegheny, seeking its 11th straight WPIAL team title, leads the girls Class AAA standings with 198 points at the end of Day 1. Mt. Lebanon is second (151.5), and Moon (125), Seneca Valley (122) and Upper St. Clair (111) round out the top five. On the boys side, North Allegheny sets the pace in first (234), followed by Upper St. Clair (144), Hempfield (93.5) and Central Catholic (90). Penn Hills and Seneca Valley are tied for fifth with 87 points. The WPIAL championships continue Friday at Trees Pool. The timed finals for Class AAA will begin at 10 a.m. with the start of Class AA set for 3 p.m. The events for Day 2 are the 100 free, 500 free, 100 backstroke, 100 breaststroke and 400 free relay.